Loyalty is a rare commodity, we seldom stumble upon people with such characteristics. If God put such people in your way, know that you are truly blessed, and ask Him to keep them near you forever. One of those people is a fellow blogger among us, who happens to be temporarily away for health purposes. If it’s okay to ask, would you please keep Ionia Martin in your thoughts for a while? For those of you who already know her, I’m sure you don’t need an introduction. For those of you who don’t, well, you’re definitely missing allot of good in this world. So please, keep her in your thoughts, prayers, and I’ll do the same. I sometimes feel trapped in memories of critical points in my life, where I keep thinking what if I acted differently at that time, what would have happened, where would I be today. I know they’re pointless and tiring, but I can’t help myself, and I keep falling in this pattern of regret, whenever I look at pictures or objects from my past. The consequences of arrogance, lies, and deceit in the name of God must be severe. Malignancy of such acts will chase those spreading them, as well as those spectating in silence. It is our duty, as followers of Abrahamic religions, to utilize the lessons learned from the story of Pharaoh and Moses, and never stand in silence in the face of similar nowadays activities. The Muslim Brotherhood, from their biggest leaders to their smallest, were a perfect example of how religion can be used to manipulate people’s political influences. How, in the name of God, those leaders were exploiting the religious illiteracy of the vast majority of the people, using it to their advantage to achieve absolute power over the country. Luckily in Egypt, during the past twelve months, significant amount of effort was exerted in various forms to educate the people about how religion can be used in politics, and how that can affect both religion and politics. The extraordinary reputable, Dr. Bassem Youssef, takes credit for introducing this analogy to his vast viewers on his famous tv show Albernameg. 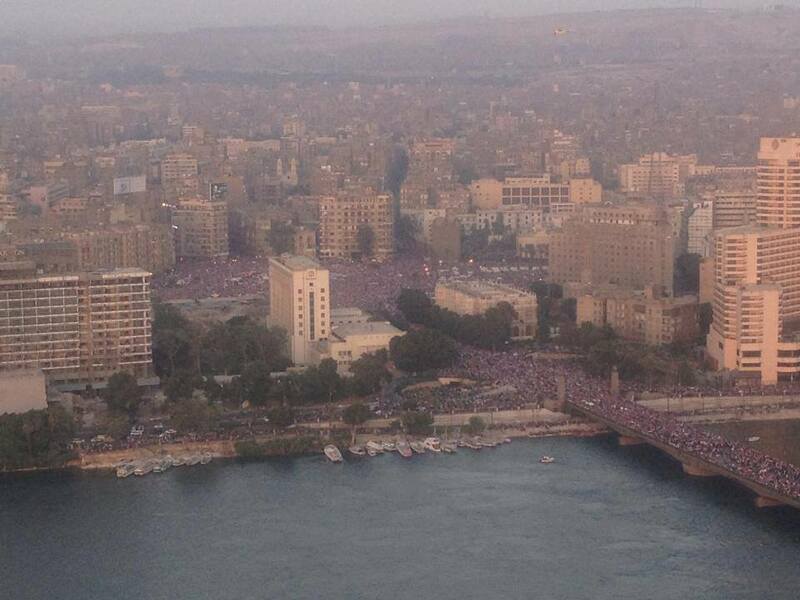 As a result, on the 30th of June of 2013, Egypt was the host of one of the largest gatherings of human beings in a political event in the history of mankind. Millions of protesters marched in streets all over the country demanding the removal of the fascist MB regime; A regime which has succeeded in nothing but uniting all of the people, with their different political orientations, against it. Back in 2011, when large amounts of people went to the streets demanding the removal of the Mubarak regime, the Supreme Council of Armed Forces forced Mubarak to step down, and eventually after 18 days of struggling, he did so to prevent further bloodshed. Similarly, when SCAF observed the massive amounts of people in the streets this year, they demanded the currently isolated Egyptian president Mohammed Morsi to step down, as the majority of the people no longer demand him nor the MB in power. Contrary to what Mubarak did, Morsi declined to step down, clinging to his right to continue his presidential term, claiming that he has came to presidency through a democratic election, and that now he has an electoral legitimacy. Neglecting the massive demonstrations against him, he gave a speech on national tv asking his supporters not to get driven by lies, and to hold on tight to his electoral legitimacy by any means necessary. A speech that has led to a division between the people, with some supporting him gathered at Rabaa mosque, and those opposing him gathered elsewhere. On the 3rd of July, the SCAF being supported by the majority of the people, took the decision to isolate Mohammed Morsi, throwing him and his MB regime out of power, and announcing a roadmap of administrating the country during a fixed period of time until a newly democratic, candid presidential election takes place. Since then, Egypt has been facing terrorism in its worst forms. Apparently, the MB decided to do what they do best; They gathered the poor who would do anything for money, as well as the religiously illiterate who could easily be deceived into thinking that what’s happening now is a war on Islam, and declared war against the millions in the streets who demonstrated against Mohammed Morsi. Unfortunately, it wasn’t before dozens being killed and hundreds being injured, that the Egyptian army intervened to stop bloodshed. Till this moment, there are still MB supporters occupying the area around Rabaa mosque, demanding the return of Morsi to the presidency. The problem of the MB is that they’re trying to find a secure way out of this dilemma; An alternate way other than being sent for trial in court, which is close to impossible right now. They were hoping to turn Egypt into Syria; Letting the Army fight the people for the sake of the president. Fortunately in our case, the army chose the side of its own people who happen to be their families and loved ones. On the other side of the planet, president Barack Obama had some sort of demonstration blindness. He’d also neglected the millions in the streets who are demanding Morsi to leave, and emphasized his support for Mohammed Morsi, claiming that Morsi had every right to stay in power, and has threatened to cut the US aid on Egypt, unless Morsi returns as a president. Apparently, the US policy was settled upon the continuance of terrorist groups ruling the middle east, and now that the great MB is down in Egypt, the carpet was swept off their feet. May Allah be with us all against any form of terrorism.